My Budo journey began in Karate Do under Soke Masaharu Sakimukai, my father, in January 1973, when I enrolled at the Chintokan Makurazaki Dojo in Kagoshima, Japan - one of more intense dojo(s) in the 70s. My first two years were three classes per week. When we moved to Kagoshima city in 1975, my father began teaching at three dojo(s) weekly. As a result, from 1975 to 1980, we trained at Makurazaki, Kaseda and Kagoshima dojo(s) in rotation, every day except Sunday. Then in 1980, after my father had visited twice on his own, our family of four moved to America. After experiencing massive culture shock living in Newark, Delaware, I really began to understand and appreciate Karate Do. I realized just how much my father's teachings aided me in settling comfortably into our new and strange habitat. I have also received some training from sensei(s) that were my father's peers, senpai(s) and teacher from both Okinawa and Japan. 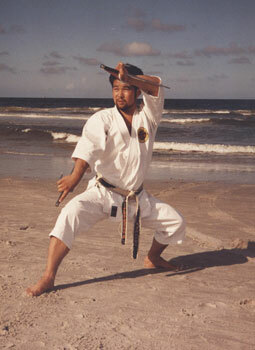 My Shodan thru 6 Dan (1984~2012) in both Shindo Muso Ryu Jodo and Mugai Ryu Iaihyodo are from Soke Hosho Shiokawa. He also taught me Shito Ryu Karate Do. Additionally, though I only received a couple of lessons, I would like to honor Soke Shogo Kuniba, as he was an exceptional Budo-Ka, teacher as well as great friend to my father. Soke Shogo Kuniba's father along with Ryu So Kenwa Mabuni were Soke Hosho Shiokawa's Karate masters. In 2008, I was promoted to So Shihan, Chief Instructor and Examiner by my father, along with representing Soke Hosho Shiokawa in the US for the next six years until he passed away in 2014. In 2010, I have received my last promotion from my father, 7 Dan and Kyoshi in Okinawan Shorin Ryu Karate Do. I am sure they are all in the "After Life Dojo" training! 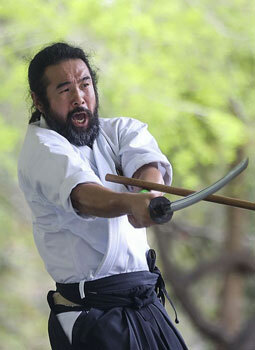 1996 - Karate Do "Shihan Menjo"
2002 - Beikoku Jodo and Kenbukan Iaido "Shihan"
2008 - Received "So Shihan"